A legend returns. This is a limited edition, genuine Aries backgammon set. Built exclusively for GammonVillage, we are proud to make these legendary boards available once again. The smoking 70's were a decade of excess in more ways than one. Platform shoes, bell bottoms, and big hairdos remain as enduring symbols of this fabulous era. The 70's, however, were also the heyday of backgammon and Backgammon Fever was spreading like wildfire amongst the Hollywood jet-set and business elite. Celebrities, such as Lucille Ball, Omar Shariff, and John Huston were frequently photographed while playing backgammon. Clubs from coast to coast were bursting to capacity offering unlimited and memorable backgammon action. It was during this time of explosive backgammon growth, that a prominent businessman by the name of Domingo Perez Aristi launched the original House of Aries, putting Mexico squarely on the international fashion map. Upon hearing that Aristotle Onassis and his wife Jackie (Kennedy) Onassis held a party at which they surprised their guests with leather backgammon sets as gifts, Senor Aristi immediately began manufacturing leather backgammon boards for several European fashion houses. Aristi believed that Jackie and Aristotle had started a fashion trend for backgammon among their famous and wealthy friends. By 1976, Aries House was producing large quantities of leather backgammon sets for companies like Christian Dior, Nina Ricci, and Hermes. All the great backgammon players sported an Aries set when they travelled to tournaments around the globe. The House of Aries had become an international powerhouse. After a terrific run lasting more than 25 years, the chaotic peso devaluation and economic crisis of the late 1990's marked the end for Senor Aristi's House of Aries. The brand was eventually sold. However, the backgammon sets created by Aries remained highly sought after commodities. Purchasing a new set was impossible. Occasionally, a well worn and used set was sold on eBay, sometimes at staggering prices. They had become true collector's items. In a partnership with the new Aries manufacturer, GammonVillage achieves a long sought after goal: to bring these beautiful backgammon sets back to life, and to make new genuine Aries backgammon sets available once again. 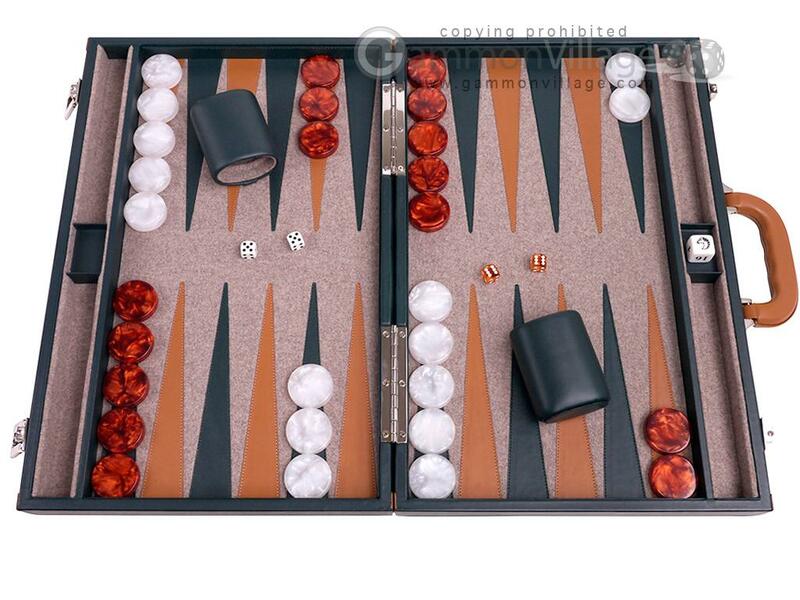 This limited edition, genuine Aries backgammon set comes complete with stones, precision dice, doubling cube, and dice cups. Closed Length: 21" Width: 14" Height: 3"
Open Length: 21" Width: 28" Height: 1 1/2"
Cup Height: 3 3/4" Width: 2" Length: 3"
Page P5115 Copyright © 1999-2019 GammonVillage Inc., USA. All rights reserved.